Update August 21: Wang’s appointement and his upcoming visit to Israel was confirmed by a spokeswoman for the Israeli Ministry of Foreign Affairs. 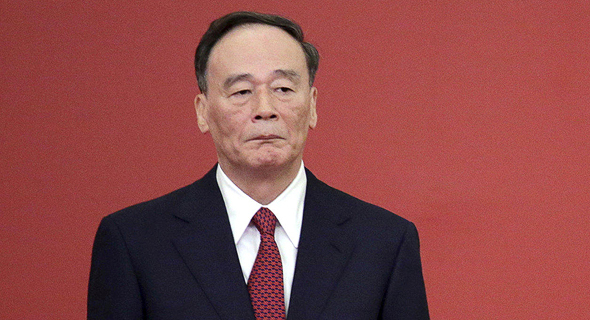 Chinese vice-president Wang Qishan is set to visit Israel towards the end of 2018, according to several people familiar with the matter who spoke with Calcalist on condition of anonymity. Wang will do so in his new capacity as the Chinese head of the China-Israel Joint Committee on Innovation Cooperation, these people said, adding that the date of the committee’s next annual meeting was not yet set but will likely take place in Israel in November or December. The China-Israel Joint Committee on Innovation Cooperation is an initiative established in May 2014 to bolster Israel-China cooperation in several domains related to innovation. The initiative aims to provide a framework for joint ventures between Israeli and Chinese government ministries. Israeli Prime Minister Benjamin Netanyahu, who is also the country’s Minister of Foreign Affairs, is the Israeli head of the committee. Liu Yandong, vice premier of China until March 2018, was the Chinese head of the committee for the previous three annual meetings held in 2015-2017. Wang has not been announced as Liu’s replacement on the committee. He will be the highest-ranked Chinese official to visit Israel in at least a decade. Wang, formerly a banker and the mayor of Beijing, was the secretary of China’s anti-corruption body, the Central Commission for Discipline Inspection until October 2017. He was appointed as vice president in March 2018 and is known to be close to President Xi Jinping. Wang has extensive foreign affairs experience and is considered a key figure with regards to U.S.-China trade relations. His first state visit since he took on the vice presidency was to Russia in May, where he attended the annual St. Petersburg International Economic Forum. While initial media reports that he would visit the U.S. in June to manage the brewing U.S.-China trade war failed to pan out, in July he met in Beijing with Chicago Mayor Rahm Emanuel and Tesla CEO Elon Musk. According to an August Wall Street Journal, a spokesman for Emanuel said the meeting was held at the behest of Wang, and that the message Wang sent was that while the current state of China-U.S. relations was not China’s preferred state, the country still intends to uphold its policies. The Trump administration has been cracking down on American deals with Chinese investors through CFIUS, the Committee on Foreign Investment in the United States, which oversees the protection of American interests by blocking foreign takeover of companies that could have national consequences for the U.S. For that purpose, the Congress recently passed the Foreign Investment Risk Review Modernization Act of 2018, which empowers CFIUS to review and block attempts by Chinese investors to gain even a minority stake in U.S. companies. Trump has been an outspoken critic of existing international trade agreements and of Chinese economic practices since his 2016 election campaign, and has repeatedly stated those practices result in the theft of American intellectual property. While Chinese-U.S. trade and tech relations are rapidly cooling, China’s economic ties with Israel have strengthened considerably. Israeli exports to China reached $2.8 billion in the first half of 2018, accounting for 8.7% of Israeli exports, according to data from Israel’s Central Bureau of Statistics, seeing a 73% increase year-over-year. Israeli exports to semi-autonomous Hong Kong add another $2.2 billion. The number of Chinese players investing in Israeli tech companies nearly doubled between 2013 and 2017, according to Israel-based market research firm IVC, though there are still relatively few players who tend to focus almost exclusively on strategic investments. In 2015, the Chinese government launched Made in China 2025, a strategic plan intended to turn China into a major manufacturing power that could rival the U.S., with a special focus on advanced technological domains including automated machines and robotics, aerospace and aeronautical equipment, agricultural technologies, and vehicles making use of renewable energy. Long considered a leader in chip design and manufacturing, Israeli technologies can be of use to Chinese efforts in these domains. China’s government may also be interested in boosting cooperation with Israel around artificial intelligence. Numerous multinationals are currently attempting to tap Israeli machine learning expertise. In July 2017, China’s state council released its new generation artificial intelligence development plan, intended to make China the leading global powerhouse in AI by 2030. In July, Israel’s Channel 10 reported that earlier this year Netanyahu directed his chief economic adviser Avi Simhon to design a mechanism for reviewing foreign investments in Israel. The channel reported the discussion revolved around the question of China and Trump’s tariff policies.